is a modern and contemporary portrait artist from Seattle. It wasn’t until after her decision to leave her career as a criminal prosecuting attorney that she rekindled her interest in art. 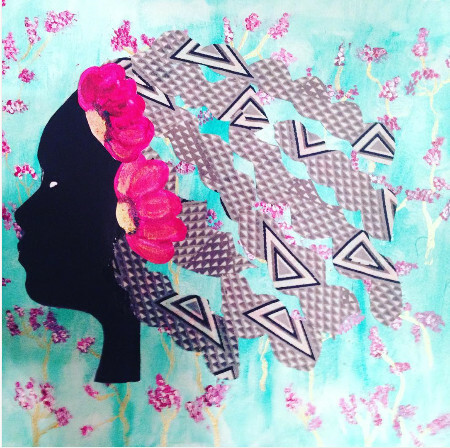 currently creates mixed media collage ortraits she calls Afro Jazz. Afro Jazz is her artistic contribution to the narrative that #BlackLivesMatter and reflects the influence of the African Diaspora with its use of vibrant african textiles and black identity. Influenced by her legal background, Gardner has developed an arts and social justice program for teens called TEENERGY that teaches young leaders how to use their creative voice for social change. As a curator for various virtual art exhibitions, she enjoys helping emerging artists define their own artistic paths using innovative media forms. She also currently serves as a board member for the Washington State Arts Commission, as an officer and Law and Justice Chair for the African American Leadership Forum, and as the Director of Operations for the Multicultural Education Rights Alliance. 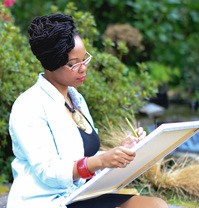 Gardner has participated in various festivals as well as both juried and non-juried exhibitions with the Onyx Fine Arts Collective, Festival Sundiata and C Art Gallery. In her very first exhibition, she received the Onyx Fine Arts Collective People’s Choice Award in 2012. Gardner currently splits her time between Seattle and Jamaica with her husband, finding creative inspiration along the way. Support the International Public Art Quote Book to GhanaBecome an ARTicipant!